No. 2, Acridium migratorium: Mosso! Mosso! IV. Quasi organo! – "Slutning" ("Ending") – More slowly, grazioso! Apocalyptic and paradisiac visions of good and evil meet aphoristic miniatures of nine small, mainly malignant insects. 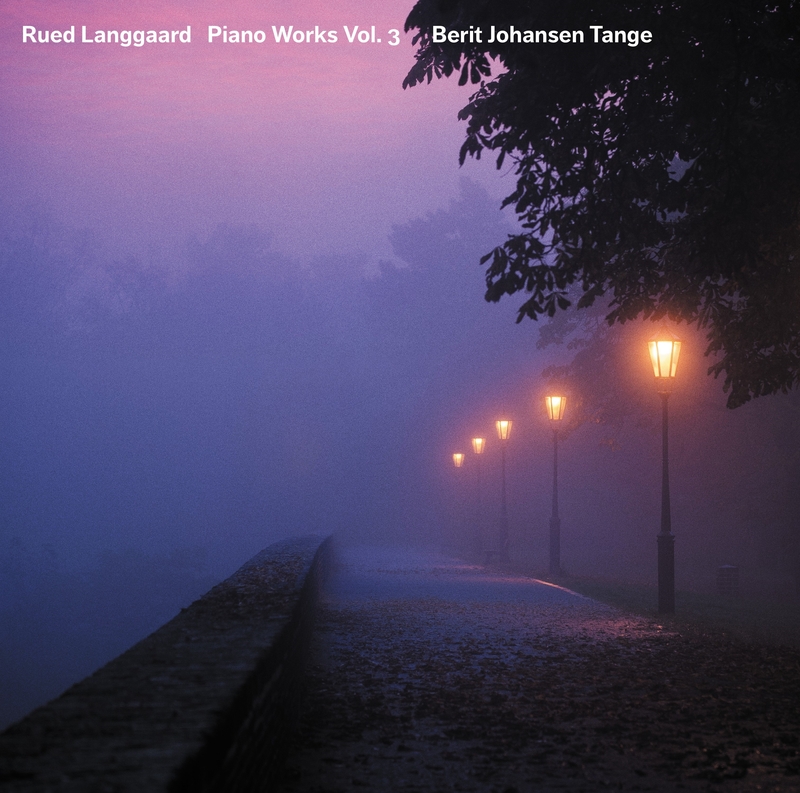 The rousing graphic imagery of Rued Langgaard (1893–1952) is on full display in this third volume of piano works by the deeply original Danish composer. Including three world premiere recordings, Berit Johansen Tange captures the mysterious forces, poetic gracefulness and absurd hysteria that are all part of Langgaard’s both dark and wondrous expression. Misterioso minaccioso – Frenetico – [No designation] 7:03 9,60 kr. No. 1, Forficula auricularia: Tempo ad libitum 2:12 6,40 kr. No. 2, Acridium migratorium: Mosso! Mosso! 0:39 6,40 kr. No. 3, Melontha vulgaris: Rubato 0:45 6,40 kr. No. 4, Tipula oleracea 0:58 6,40 kr. No. 5, Libelulla depressa: Presto 0:58 6,40 kr. No. 6, Anobium pertinax: Tempo ad libitum 0:46 6,40 kr. No. 7, Musca domestica: Agitato – Slowly – [Tempo I] 1:26 6,40 kr. No. 8, Julus terristis: Prestissimo 0:57 6,40 kr. No. 9, Culex pipiens 0:38 6,40 kr. Allegro moderato – Mosso – [Tempo I] 7:02 9,60 kr. Strepitoso (Noisy) – Espressivo – Strepitoso – Rimbombevole (Resoundingly) – Vernale agitato – Fiammante quasi lanterno in pioggia – Aspramente (Severely) 9:03 9,60 kr. I. Andante marcato – Lento – Andante 3:29 6,40 kr. II. 1/4 = 60 3:26 6,40 kr. III. 1/4 = 96 Efterhånden så hurtigt som muligt (As fast as possible, little by little) 1:24 6,40 kr. IV. Quasi organo! – "Slutning" ("Ending") – More slowly, grazioso! 4:18 6,40 kr. V. 1/4 = 92 – Langsommere (More slowly) – 1/4 = 69 – Langsommere (More slowly) 3:41 6,40 kr. I. 1/4 = 84 3:05 6,40 kr. II. Introduction: Værdigt (Dignified) – Sang (Song): Same Tempo – Intermezzo – Organ – Foraar (Spring): Tempo 1 – Grazioso, con moto 9:17 9,60 kr. III. Ordrup: Grazioso 1:04 6,40 kr. Misterioso – Esaltato – Triumphale 4:21 6,40 kr. “I see what I want to do like a picture, and then the music develops all by itself”. So says Rued Langgaard in an interview in 1922, in which he makes it clear that he takes his starting point in his own imagination when he creates music. The tradition and the customary forms known from sonatas and symphonies are not crucial. It is the inner visions and moods that are crucial to Langgaard. In the seven piano works, all of which have graphic titles, and were composed in the period from Langgaard’s youth in 1917 until the last half of the 1940s, we experi­ence Rued Langgaard ‘unfiltered’. A psyche translated into music. And for good reasons. Most of the pieces were given their first performances several decades after Langgaard’s death, so there was no interested audience waiting for the music, no listeners for Langgaard to relate to while he composed the music. Instead Langgaard unfolds a succession of deeply personal manias, as if they are internal confessions or musical letters to himself. Along the way Rued Langgaard engages with some of the most important themes of his life. All the pieces are subject to an idea that the world is profound and that mysterious forces hold sway. The notion of an imminent religious apocalypse comes to expression in As a Thief in the Night. Evil is thematized in Insectarium and In the Flickering Autumn Lamplight. And the idea of life as martyrdom is an impor­tant element in Shadow Life and In the Flickering Autumn Lamplight. Besides the quotation from the Bible (Second Epistle of Peter) Langgaard refers to a short story of the same name ‘Som en Tyv om Natten’ (As a Thief in the Night) – written by Johannes Jørgensen in 1921 – which describes how Judgement Day is played out on a summer night in Copenhagen, as the residents of the city dis­appear one by one, without warning, from the surface of the earth. In this modern version Judgement Day steals into the individual in the same way as Langgaard’s music begins – piano – only later to bare its fangs. The music is virtuosic, free-flowing and impactful, with reminiscences of Franz Liszt, with whom Langgaard’s father Siegfried Langgaard had studied. But with an abrupt transition to a ­solemn, hymn-like choral the music takes on a collage quality that makes it unmistakably art of the 20th century. The chorale and the sub­se­quent music are a re-use of an extended passage from the first movement of Langgaard’s nine-year-older Music of the Abyss, in which the chorale, after a period, is assaulted by a hectically descending note sequence that breaks destructively into the majestic progress of the music. But whereas in Music of the Abyss Langgaard in the end creates a kind of harmony as he lets the chorale die away in an open major chord, it is different with As a Thief in the Night, where the music instead slips its leash as the rhythmic intensity deepens and the modulations increase until the music is so to speak pulverized. Corroded from within. Add to this that the effect with the descending sequences that disturbingly break into the progressing chorale originally comes from Carl Nielsen’s piano work Theme with Variations (1916). In the apocalyptic music As a Thief in the Night Langgaard not only eradicates his own creation. At the same moment he dismisses his older composer colleague. Insectarium is cryptic music and far more than a new version of Carnival of the Animals. With the subtitle “9 Puzzle Pictures (for Piano) by Crótalus durissus” (a South American rattlesnake) and with the choice of insects, several of which are pests, Langgaard signals that something abnormal and malignant is concealed in the music. Insectarium thus turns out to be small, corrosive studies – with an absurd twinkle in the eye – of the destructive forces that Langgaard experienced in the age, and on which he also focuses in the major work from the same time, Music of the Spheres, and later in the opera Antichrist. The desperate utterance in this song from his youth, Det rinder med Dug, has for the mature Langgaard become quiet resignation because of a mood of defeat that is manifested right from the beginning in the main theme, the second half of which consists quite symbolically of three descending notes in a minor scale. Later, in the most agitated passages of the fantasy, the three descending notes are repeated again, now with dramatic accents as if fate is knocking on the door with relentless con­sis­tency. However, the response is by no means heroic, it is only a repetition of the wistfully singing main motif. Despite the despondency, Langgaard shows himself in Shadow Life from his most poetically graceful side – perhaps because the fantasy was finished at Blidah­park in Hellerup in July 1945. There, close to the Øresund and his childhood home in Frederiksstaden in Copenhagen, Langgaard, on a long summer holiday from his organist post in Ribe, had a refuge and the freedom to dream his way back to the hopeful world of his youth. Even as a child Rued Langgaard was fascinated by the flickering light of the gas lamps in Copenhagen. In the apocalyptic opera Antichrist, each scene is staged with gas lamplight that changes character along the way and culminates with the former world going up in flames. In In the Flickering Autumn Lamplight we find ourselves in Hell, where the flames consume the tormented souls. All Hell is loose from the very first notes, which are to be played strepitoso (noisy), with the musical motifs shooting up like rockets. With coruscating accents Langgaard wants to light a bonfire in the music. In a subsequent section, which is to be played rimbombevole (resounding), the lower regions of the piano are activated until, towards the ending, in the section Fiammante quasi lanterna in pioggia (Flaming like a lantern in the rain), we hear a tremolo in the high register of the piano, imitating the crackle of flames. and takes its strength from the night. By ‘perdition’ is meant annihilation in a religious sense, beyond redemption by God; and with harmonies at the edge of the familiar major-minor system, related to those of the most boundary-breaking works of Richard Strauss, Langgaard wishes here to depict a world possessed by evil. The only question is whether he sees himself as the prey of this wild hunt, or whether it is rather about the enemies in Danish musical life to whom Langgaard had taken a dislike. Langgaard sums up some of his darkest, most mystical and self-destructive thoughts in the “little piano sonata” Le Béguinage. The title refers to a place in Bruges inhabited by beguines, women belonging to a pious Catholic lay movement. But this is no pious music that Langgaard has created. On the contrary. Added in brackets after Le Beguinage is “means holiness (mockingly)”, and in purely musical terms Langgaard sneers at the religious. Good and evil – Christ and Antichrist – merge together in an absurd hysteria, and Langgaard himself plays a major role. In each of the last four movements, and most clearly at the very beginning of the third move­ment, we hear the same motif hammered out, a B flat major seventh chord played in a descending progression. The motif also appears in other enigmatic works by Langgaard, and it appears to be a personal ‘fate motif’. The absurd plays a major role throughout the work. Towards the end of the fourth movement, whose intense first subject, according to a note, is to be repeated “endlessly”, we hear a number of arpeggiated chords. After these a kind of choral response is inserted, to which the manuscript adds a text, “Ave Mari-a!”. But the notes are not to be played beautifully, they are to be hammered out fortissimo, and after the hysteria has culminated in a series of repetitions, as the conclusion of the movement Langgaard has noted “Mania religiosa” – religious mania. The music for the end of the last movement, on the other hand, sounds beautiful and serene. It is a quotation from Antichrist, from a passage where the words “Pray to the Virgin, pray for thy salvation” are sung but, it should be noted, by the figure ‘The Lie’. In the ‘little sonata’ Chiesa madre, which means Mother Church and refers to the Catholic Church, Rued Langgaard refers to personal experiences in the 1920s, when he several times felt drawn to Catholicism. The music most of all has the character of a succession of religious meditations of an almost private nature, and it is written for the instruments that Langgaard himself played: harmonium, organ or piano. The first movement takes the form of a fervently devotional organ chorale, whereas the first section of the second movement is intimate music well suited to the limited keyboard of a harmonium. Towards the end of the second movement, howe­ver, he has written “Organ” next to some broad, powerful chords, after which there is a sudden change to a playfully light, idiomatic piano music of a nostalgic character with the title “Spring”. A similar mood prevails in the last movement, where Langgaard, with the title Ordrup, remembers St. Andrew’s College at Ordrup­høj, where he had con­tacts with a Jesuit community in 1927. Chiesa madre is a sister work to Le Béguinage. Most of the movements in both sonatas come originally from the suite “X”, Mood Madness from Ordruphøj (Gala religiosa). But while in Le Béguinage Langgaard cultivates an absurd, mad­ness-tinged musical idiom, Chiesa madre constitutes a peaceful, soulful universe; all in all, a brilliant example of Langgaard’s ambivalent religiosity and occasionally schizo­phrenic musicality. Langgaard even refers to his Catholic period in the 1920s in Sponsa Christi tædium vitæ. The first part of the title, Sponsa Christi, means ‘Bride of Christ’, a term used of the Catholic Church in general; it is also the title of a number of now-lost hymns for piano from 1923. And in the ­triumphant conclusion Rued Langgaard quotes himself, since it is a loan from the piano collection Angelus from 1924. With the second part of the title, tædium vitæ, which means weariness of life and is often equated with Sloth or Acedia as one of the Seven Deadly Sins, Langgaard signals that there is a danger built into all this euphony. The most striking aspect, however, is that the opposites in this music are united in a totality marked by a harmoniously progres­sing development with arpeggiated chords – and with a mood of ecstasy bubbling just below the surface. In Sponsa Christi tædium vitæ the musical pieces in Rued Langgaard’s religious world fall into place. Microphone main array: 3x DPA 4006TL. + 2 DPA4011TL for surround channels. Pyramix DAW system with HAPI preamp/converter and Tango Controller. Publishers: The Rued Langgaard Edition, publ. by Edition Wilhelm Hansen, and Engstrøm & Sødring (Le Béguinage).